Baz and I only did a road ride today as family commitments meant time was short. 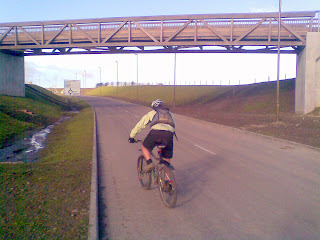 We still managed 19 miles up and around Carrington and back up the new Bonnyrigg bypass which is still to be officially opened The picture is of the rather nice looking bridge over the new road which carries the Penicuik to Bonnyrigg cycle way. 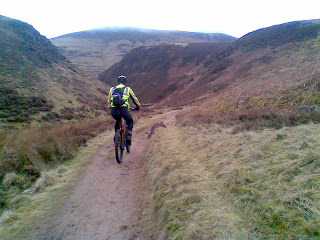 Clive and I set off at 6am this morning to do what is now known (to us anyway) as the Pentland loop. Cycle to the village of Carlops, then up the track there that goes over the Pentland Hills to Balerno, back up to the Pentlands again and back down to Flotterstone before returning home via Penicuik and Rosslyn. Baz and I were convinced that we,d taken the wrong path halfway over so much against Clive's better judgement I convinced him that we should take a left turn at one point instead of a right. Bad choice! 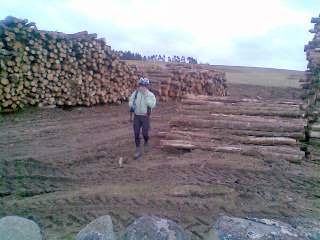 It was disasterously boggy wet and steep and the final straw came when we had to cycle down a roadway made of logs over the boggy ground. They were absolutely lethal being really wet and greasy, first Clive went down like a ton of bricks and then I came off as well. 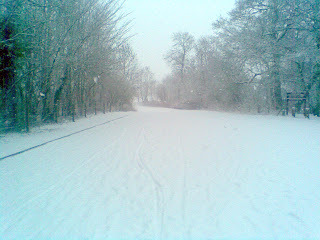 Needless to say any more of these roads were walked down. The bruises will be proud souveniers to display to Baz!! 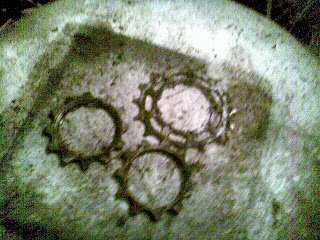 Worn chains and gears etc. To the non-biker this will be extremely boring, but what the hell, here we go! At the weekend I had chain slip which indicated either (1) a worn chain, (2) worn front chain rings, (3) worn rear cassette,or (4) the whole goddamn lot were knackered. I started off by replacing the chain which had obviously seen better days. 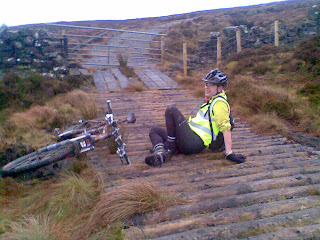 This resulted in even worse chain slip on the front two inner chain rings which had to be then replaced as well. 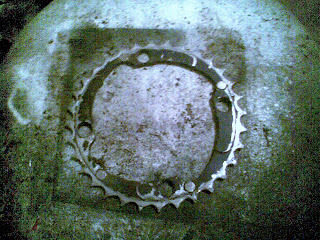 The upshot of this was the chain was jumping on the three highest gears of the cassette, but performing ok on the rest of the gears. 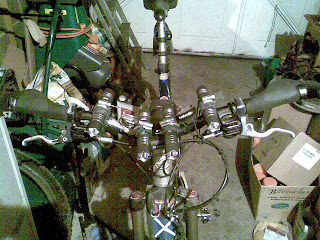 Being a tight old git I reckoned that maybe if I changed the three high gears on the cassette with three from an old one which looked fairly good I might just get lucky and save myself about 35 quid for a complete cassette.............and guess what.........it works!!! Yippeeeeeeeeeee!!!!!!!!!!!! 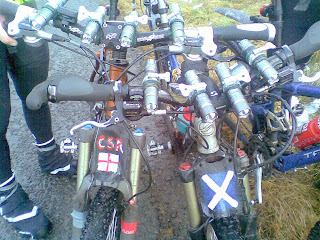 The discussion on todays' ride was: what is a ridiculous amount of lights (on a bike) called. There were several suggestions, the best of which were, a flood of lights, a luminance of lights and a bright of lights. Any more suggestions gratefully received and considered and the result will be made known to all and sundry! The ride today over the Pentland Hills had to be abandoned due to too much deep soft wet snow, at least that's what I'm saying , some others I know wanted to continue on foot pushing their bikes, not an option as far as I was concerned! 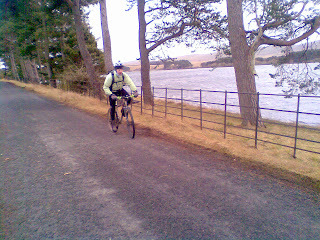 We did however manage to rack up 41 miles with a trip that took us round Gladhouse reservoir on some of the many back roads of Midlothian. eighteen of the damn things!! 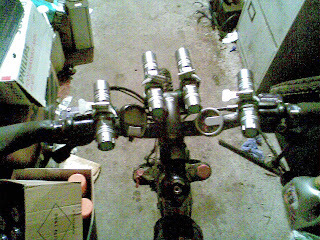 I now have enough lights on the front of my bike to rival Blackpool Illuminations and if I was to run them one at a time, I should have a total run time of about twelve hours. There's also one on my helmet by the way just to confuse anyone approaching me even further! 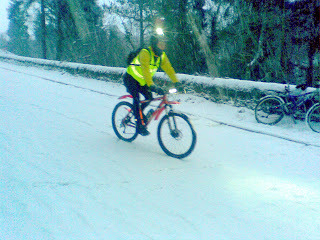 They've had a rather shaky and slidy trial run on the snowy and icy pavements near the house but the real trial of their strength will be on Sunday when it looks like it's going to be a Pentland Hills ride due to the snow still at Peebles. Setting off at 7 am this Saturday morning , Clive and I never expected the odd snowflake that was falling to turn into an almost blizzard for the 2 hours that we were out. 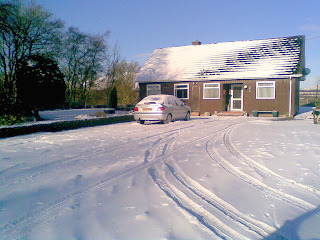 By the time we returned almost 3 inches of snow had fallen. 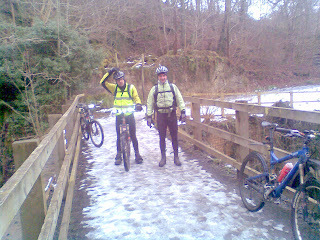 Clive at the entrance of one of the tunnels along the Penicuik cycle path which was an erstwhile railway line. 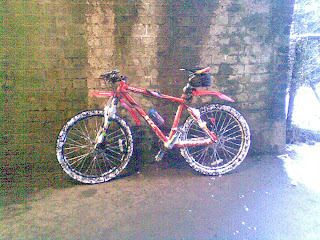 The infamous "pink bike" parked inside the tunnel. 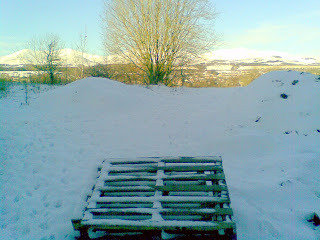 Anyway by the look of all that snow there'll be no expeditions over them this weekend. I liked the look of this wooden chalet type house set against the blue frosty sky, my camera phone doesn't do it justice. 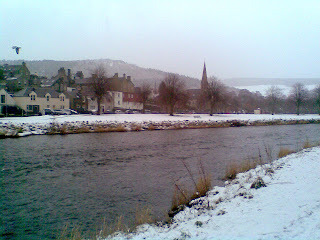 My work today took me to Peebles via Leadburn which as usual, when there's snow about, had more than it's fair share of the stuff. 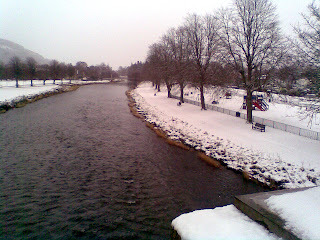 The Tweed was running fairly high but if there should be a quick thaw with heavy rain I would imagine it will be a heck of a lot higher. Whats he been up to round the back of the logs?! 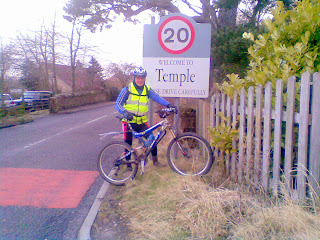 Today's ride was on the roads of Midlothian through the villages of Carrington and then the quaintly named Temple. While Carrington is mainly flat, Temple is built on quite a steep hill or brae. From there we carried on to the Gladhouse Reservoir which I have heard being called "Gladys Reservoir" by one local worthy who has now sadly passed on to the big reservoir in the sky. This is apparently the biggest stretch of fresh water in Midlothian and is one of the main providers of drinking water to Edinburgh as well as being a popular brown trout fishery. 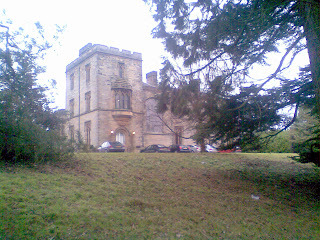 On the way back home we did a short detour up a track and discovered a rather grand house which appears to have gone the way of many grand houses and is now an old (rather rich) folks home. 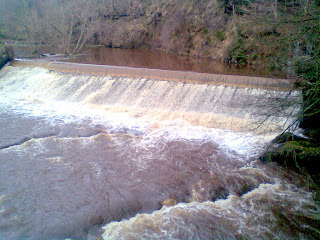 Forty miles yesterday and thirty one today, not bad for a winters weekend .